SPORTS Minister Erastus Uutoni delivered an empowering speech to the Brave Warriors during one of their training sessions ahead of the team’s final group AFCON qualifier game against Zambia that will take place on 23 March. The nations will seek to its third appearance at the finals that will be held in Egypt from 21 June and 19 July 2019. During the surprise visit from the minister, Utoni rallied the team and reiterated that Government and Namibians in a collective effort will support them to reach the 2019 AFCON finals. “You must be disciplined and prepare well for Zambia. You will be representing the whole nation and everyone is supporting you. We have organized ourselves to follow you and those that will stay at home will sit in front of their TV and cheer for you”, Uutoni stated. 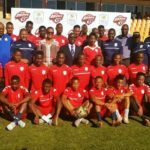 Brave Warriors coach Ricardo Mannetti promised the Minister that his players are going to get the victory and qualify in Zambia. “We started our preparations last week, ahead of Zambia and I can assure you that the support we receiving in the build for our biggest match in the last ten years surely motivates us to do well and we will go to Zambia to win. Saturday 23 March, things will be tough on the pitch but I know Sunday on our way back home everyone will be happy and celebrating because we will win and qualify” states Mannetti. The Warriors will continue with preparations at the NFA Technical Centre until this weekend, whereas from Sunday, the training camp will move to Johannesburg, where the foreign-based players will join and on Independence Day, 21 March, they will travel to Zambia.